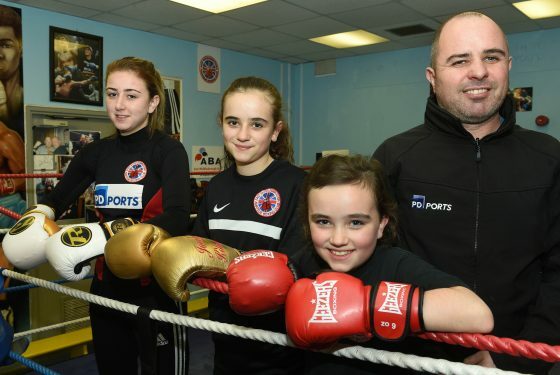 Middlesbrough boxer Macy Kilkenny believes her dreams of Olympic and Commonwealth glory have taken a big step forward thanks to her knockout sponsorship deal with PD Ports. The 18-year-old was given £10,000 by Teesside-headquartered ports operator PD Ports over five years to boost her promising amateur career and support her ongoing development. The donation is allowing the East Middlesbrough ABC flyweight, whose dad Jason is a training instructor at PD Ports’ bulk terminal at Teesport, to maintain her progress on the domestic and international scene as she takes aim at Tokyo 2020 and Birmingham two years later. Junior ABA and Clubs for Young People (CYP) champion Macy is locked in a three-way battle for the top England spot at her weight with Simran Kaur and national No 1 Chloe Watson, who narrowly beat her on a split decision in last season’s England National Youth Championship semi-finals. And she has further shown her quality abroad, adding to the 2017 Golden Girls Championship silver she won in Sweden with victory over the Irish champion to strike gold at the Esker Box Cup in Ireland, and splitting a win and loss in two bouts at an international duel in France. Macy is confident of using those results as a platform to build on as she strives to land the biggest honours in her sport, with the support of her PD Ports’ funding. “I’m pleased with the way everything is going so far, and I’m really thankful for my sponsorship because it’s a big help with things like kit and travel,” said the England challenge squad boxer, who received the first of her funding in 2016. Macy, whose 11-year-old sister Jocelyn won a national minors’ boxing title this year, is stepping up to the senior ranks. She is also a member of the Sport England-funded Talented Athlete Scholarship Scheme and attends twice-weekly strength and conditioning at Durham University. A diligent student, Macy left Middlesbrough College with a double distinction in sports coaching and is now undertaking a degree in sports science at Teesside University. “Going to university will be good for my boxing as well, because I’m going to be doing 16 training sessions a week there,” Macy explained. “That’s important as it’s going to be quite a big season for me coming up with it being my first as a senior, and I will be boxing people a lot older than me, which will be a bit of a challenge. But I think there will be a lot more opportunities for me to shine. “The Tokyo Olympics has got to be my main aim now, and the Commonwealth Games at home in Birmingham after that.” she added. Macy’s dad first approached PD Ports for a nominal donation as part of its employee engagement scheme, Find it Fund it. The company recognised Macy’s talent and dedication in deciding to give her a significant donation. PD Ports’ Head of PR, Communications and Marketing, Kirsten Donkin commented: “As a company which feels a strong sense of moral and corporate responsibility in the community, and especially in supporting young people development, PD Ports is always happy to help people from the region like Macy who are hungry and determined to be the best they can possibly be. “We work with a number of organisations across the region to raise aspirations of young people and highlight the many career opportunities here on Teesside, and throughout the shipping and logistics sectors, through the likes of the High Tide Foundation and the Tees Valley Logistics Academy. Photo caption: Macy (right) with her younger sisters Jocelyn and Eden, and their father Jason.